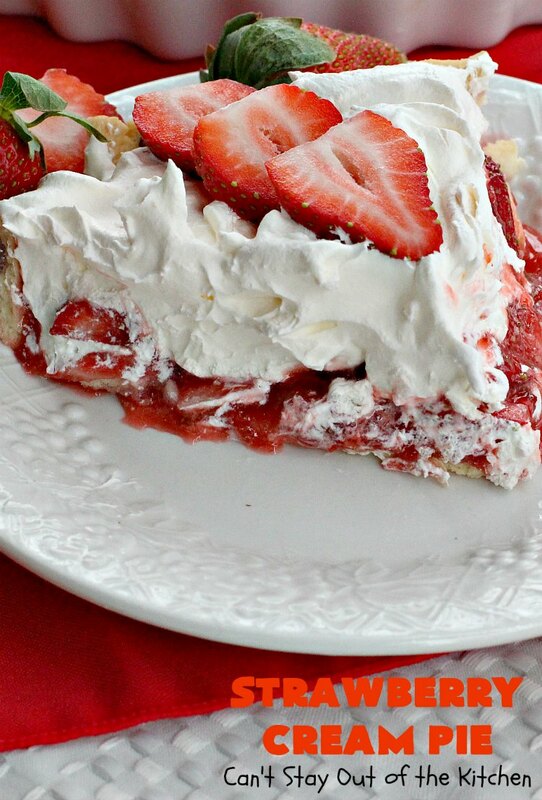 I love my Mom’s Strawberry Cream Pie. 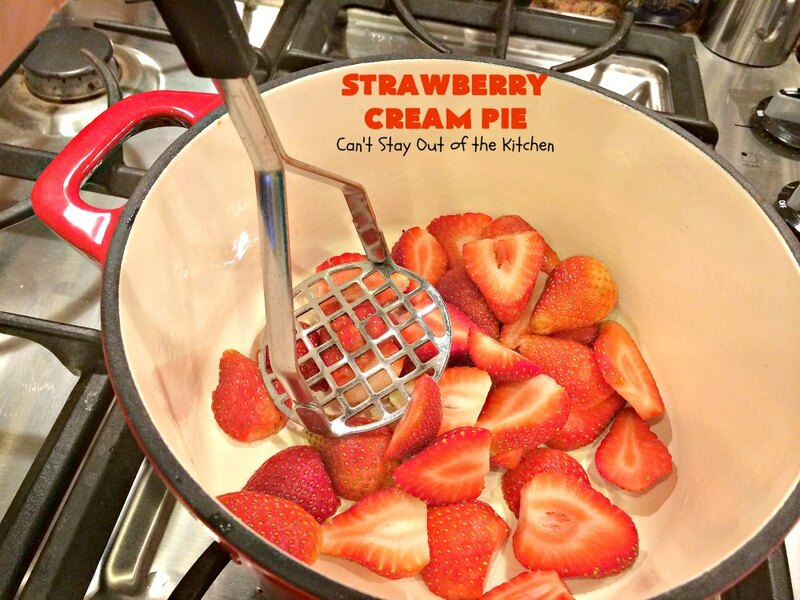 Fresh strawberries are laid in a baked pie crust, then a strawberry filling that’s cooked on top of the stove is poured over top. 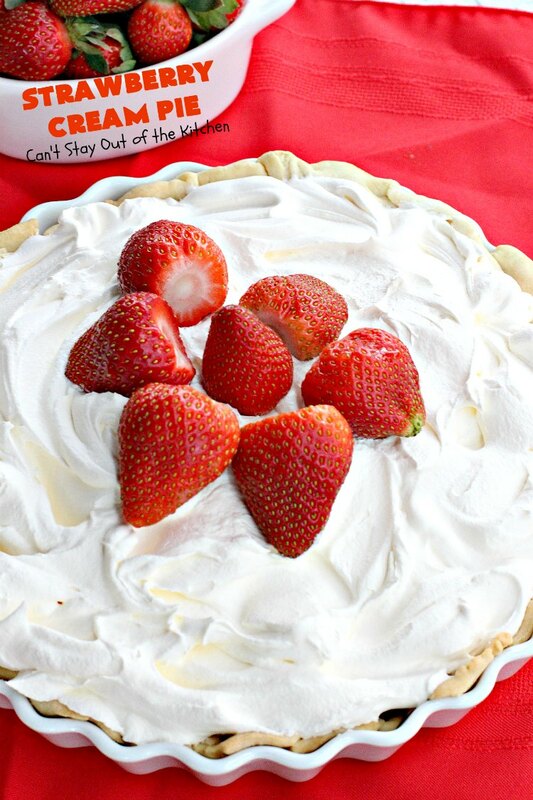 After making sure the filling is cold, Cool Whip is spread over top and the pie is garnished with fresh strawberries. It is an incredibly delicious pie. I highly recommend you put it on your Valentine’s Day menu for your sweetheart! Mom used to make this pie for us all the time when we were growing up. She made this version of strawberry pie more than one with a double pie crust. 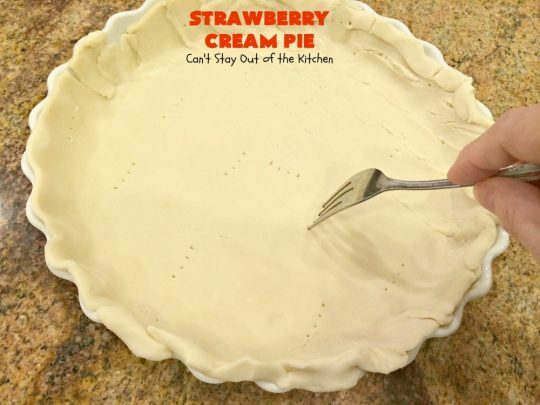 Strawberry Cream Pie was actually the first pie I ever remember making. 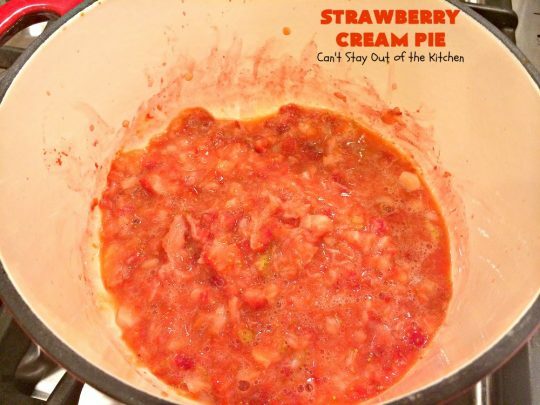 For a novice cook like I was at the time, it made a pretty spectacular dessert, even if my pie crust at the time wasn’t anything to write home about. Shortly after we were married, John’s parents informed us they were coming to Orlando for a physician’s convention. We planned on having them over for dinner but I was the world’s worst cook at the time and had no clue as to how to plan a dinner party. My husband and I both worked at Walt Disney World at the time and we ate a lot of our meals there! I started asking several of the guys on Monorails (where we had both worked for several years), if they had any suggestions for our menu. One guy in particular was a big help. He had signed off on our marriage license as a witness just six weeks previously, and he suggested Green Bean Casserole, steak, baked potatoes and store-bought rolls you could heat up in your oven. Back in the mid to late 1970s I had never even heard of “Green Bean Casserole.” He told me I could find it on the back of a Campbell’s soup can. 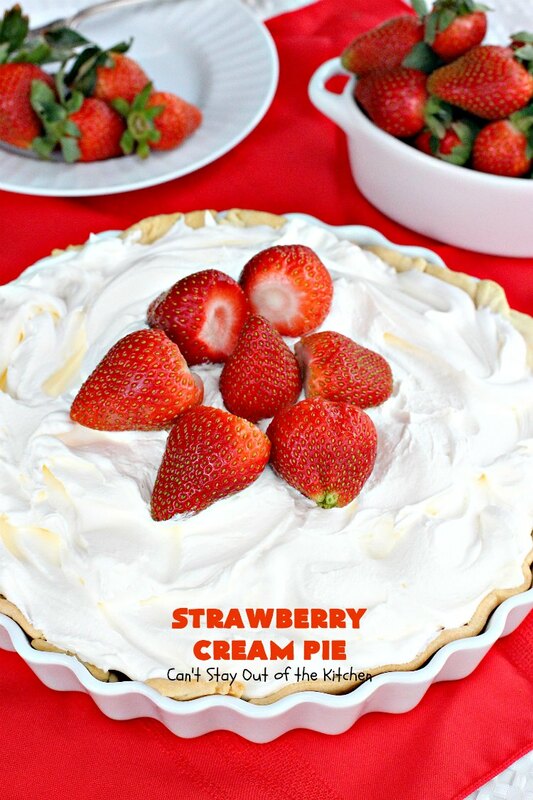 I knew immediately that the dessert I would make was this luscious Strawberry Cream Pie because I could make it the night before. When we got home from work, John took care of the steaks, baked potatoes and rolls, and I popped the Green Bean Casserole into the oven. The verdict? His folks loved everything, but they raved over the Strawberry Cream Pie. It is certainly a pie to get excited about. This pie fits well into those old-style metal 9″ pie pans of yesteryear. Quite frankly, the baking dishes that are available these days hold a lot more filling that what those old pans did. Since all my recipes are for the old-style pans, I find that I’m having to increase the ingredients about 1 1/2 times for these deep dish pans. While I stayed with the original recipe for this pie, it really would have set up better and looked prettier had I made a batch and a half of the strawberry filling. You can make your own determination on what your need to do to fit your own baking equipment. If you’re looking for a pie to WOW your in-laws, potential clients, or just family and friends, Strawberry Cream Pie will do it! 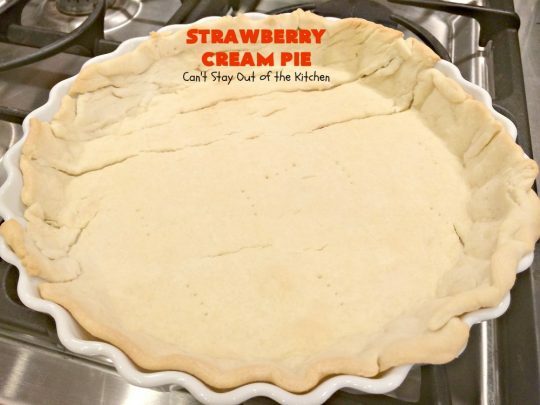 It’s not overly difficult and if you don’t feel like making your own pie crust you can use a store bought one. Mine was actually store bought this time because John got a couple boxes of free pie crust along with some other things he purchased at the store a few weeks ago and I’ve been trying to use them up. Strawberry Cream Pie is a dynamite pie you are sure to love. Give it a try–but be prepared to salivate and drool! 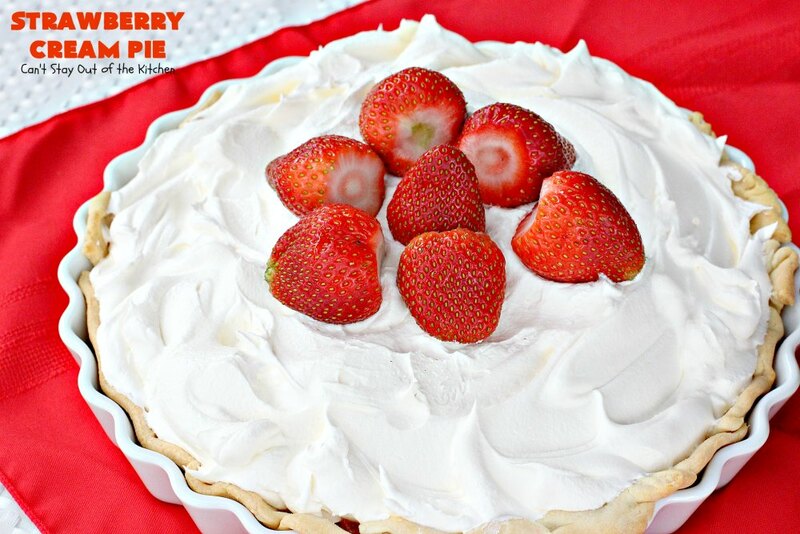 Strawberry Cream Pie is one of my favorite pies. 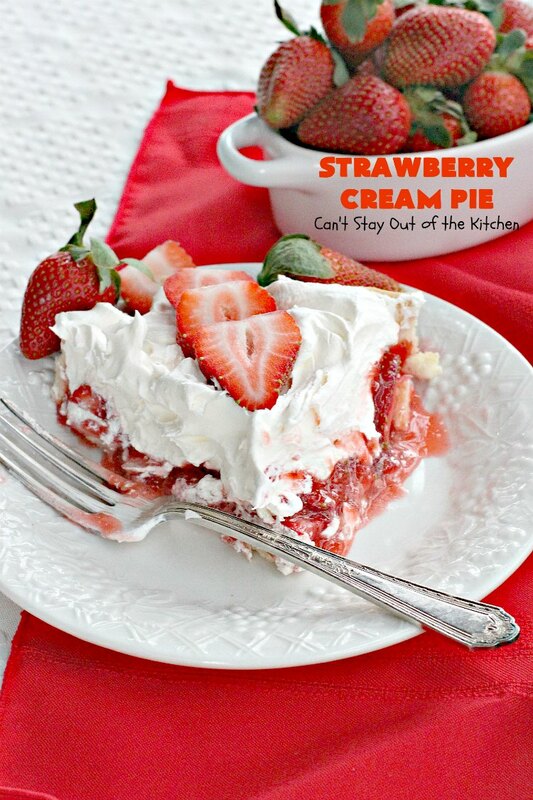 This luscious pie is ooey, gooey and delicious! 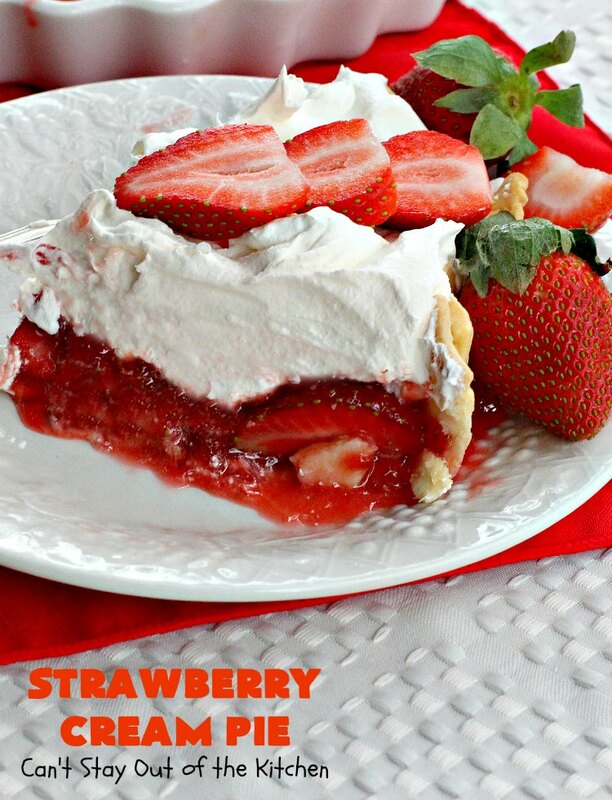 If you enjoy strawberries, you’ll love this creamy pie. 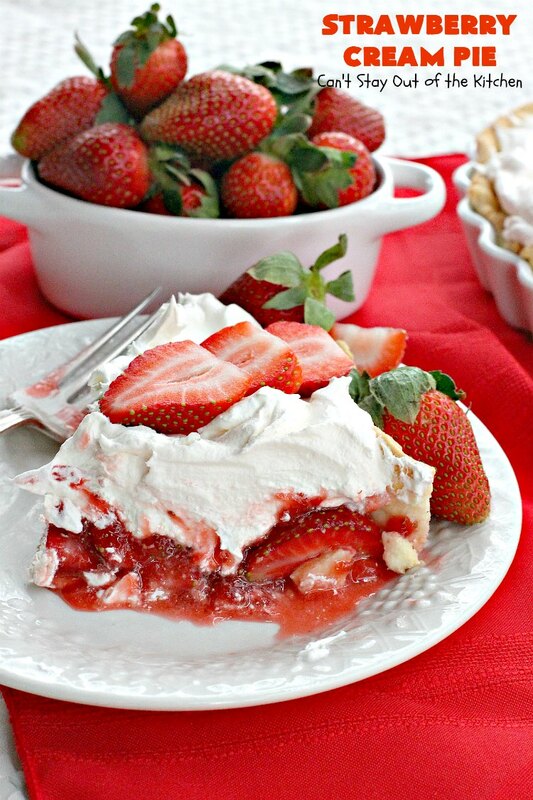 Strawberry Cream Pie is perfect for the Fourth of July holiday. I used these 5 ingredients! This is a super easy recipe for a pie. Place pie dough into a pie shell. Flute edges. With a fork, prick the pie shell on the bottom and up the sides of the crust. This will prevent shrinking while baking. Bake pie shell about 15 minutes at 350, or until pie crust is lightly browned. While pie crust is baking, work on filling. Wash and slice half of the berries. Place them in a medium saucepan over low to low-medium heat. Mash strawberries with a potato masher. Combine sugar and cornstarch in a bowl. Make sure NO lumps remain from cornstarch. Add sugar mixture to mashed strawberries. Stir ingredients to combine. Cook over low to low-medium heat for about 10 minutes or until thickened. Stir continuously so mixture doesn’t scorch on the bottom. Allow mixture to cool completely. I have sometimes put this mixture in the freezer to cool it more quickly if I am in a rush to get the pie done. Spread remaining strawberry slices in baked pie shell. 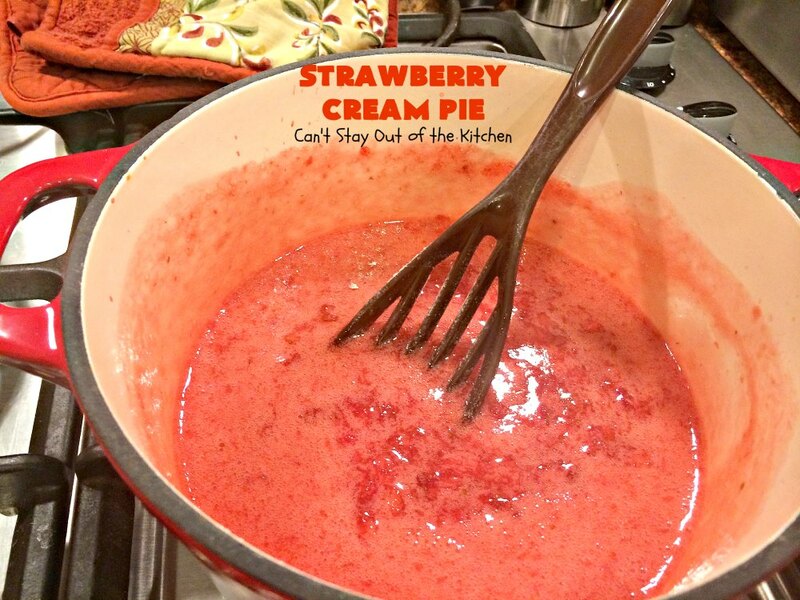 Pour cooled, cooked strawberry mixture over top of fresh berries in baked pie shell. Refrigerate an hour or so. Top with Cool Whip. Garnish with fresh strawberries, if desired. Refrigerate several hours or overnight. 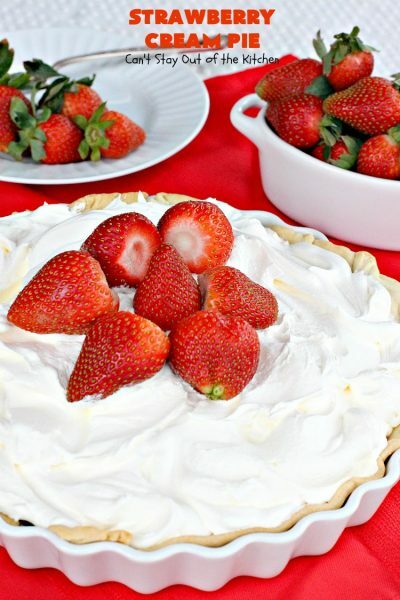 Serve slices of Strawberry Cream Pie with fresh, sliced strawberries, if desired. This is the perfect dessert for company. You can make it a day in advance to cut down on your work load the day of your meal. You and your guests will be drooling over Strawberry Cream Pie after every bite. 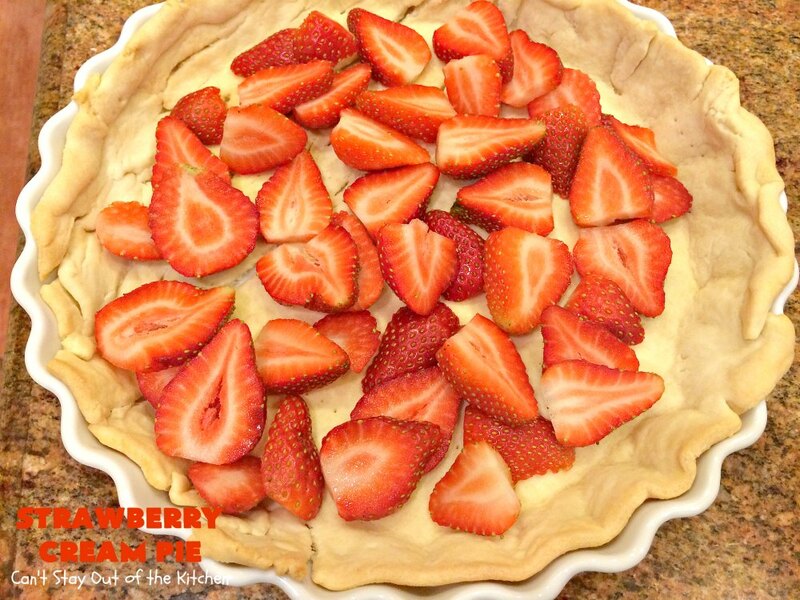 This lovely pie uses fresh and cooked strawberries in a baked pie shell. Then everything is topped with Cool Whip! Wash and slice strawberries. Reserve half of the berries; mash remaining berries, bring to boiling over low to medium heat. Mix sugar and cornstarch thoroughly so no lumps remain. Add mixture sugar to strawberries in saucepan. Cook slowly over low to low-medium heat for 10 minutes or so, until mixture thickens. Cook slowly and stir continuously so the mixture doesn’t scorch or stick to the bottom of the saucepan. Pour over uncooked berries placed in cooked pie shell. If desired, place some nice reserved berries on top. NOTE: Preparation time does not include making or baking pie shell. 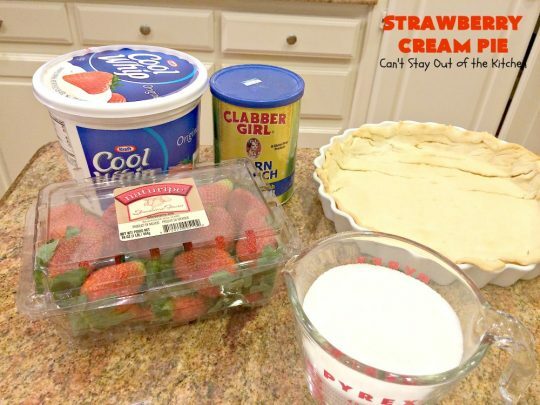 NOTE: While I have used frozen berries for this pie, if you want to decorate the top you really need fresh strawberries. NOTE: I have placed the pan of cooked strawberries in the freezer to cool to speed up the process. NOTE: Prick unbaked pie shell with a fork on bottom and sides of pie to prevent shrinking while baking. NOTE: The amount of filling is only enough for a small 9" pie plate. 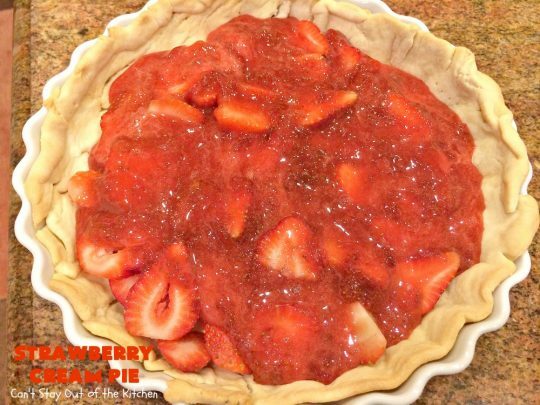 If you have a deep dish pie plate, you may need to increase the recipe and make 1 1/2 or even 2 batches to fill that size pie plate. 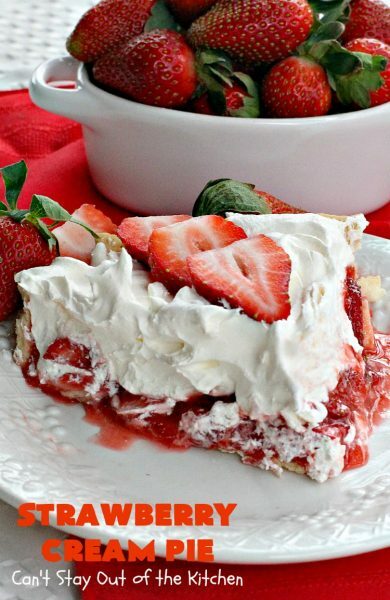 This lovely pie uses fresh and cooked strawberries in a baked pie shell. Then everything is topped with [url href=”http://www.kraftrecipes.com/coolwhip/coolwhip.aspx#/home” target=”_blank” title=”cool whip”]Cool Whip[/url]! Preparation time does not include making or baking pie shell. [br][br]While I have used frozen berries for this pie, if you want to decorate the top you really need fresh strawberries. [br][br]I have placed the pan of cooked strawberries in the freezer to cool to speed up the process. [br][br]Prick unbaked pie shell with a fork on bottom and sides of pie to prevent shrinking while baking. [br][br]The amount of filling is only enough for a small 9″ pie plate. If you have a deep dish pie plate, you may need to increase the recipe and make 1 1/2 or even 2 batches to fill that size pie plate. The combination of fresh strawberries and a cooked strawberry filling is awesome. 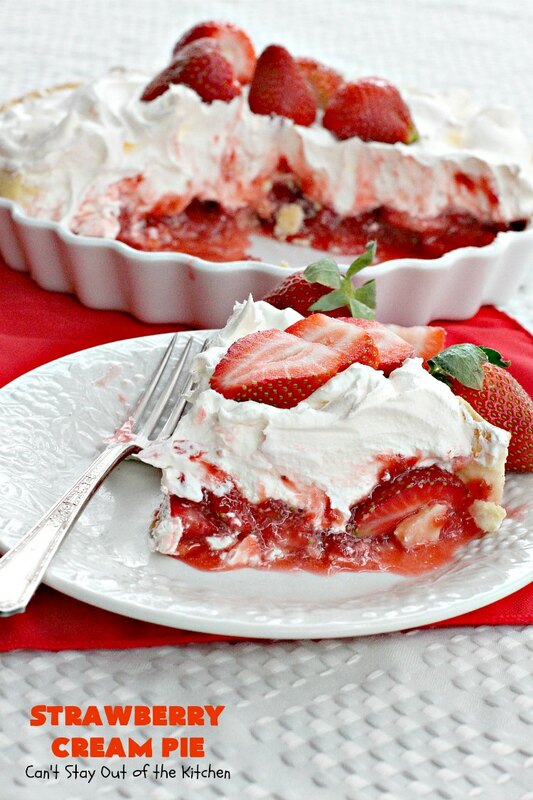 This beautiful and festive pie is great for Valentine’s Day and other special occasions. This was delicious but Way To sweet with the 1 cup of sugar. Depending on your tastes, a 1/4 to a 1/2 would be plenty. Hi, Chris. Thanks for your input. So glad you enjoyed the recipe. This strawberry dessert was the best ever,and so easy. I am sharing it with friends and family, thank you so much for sharing !!! Hi, Pam. I’m thrilled you and your family and friends enjoyed the recipe. This was a recipe from my mom. I’ve always treasured it. This look amazing! I might have to try it soon! Thanks, Erica. It is a delightful pie! This looks great! 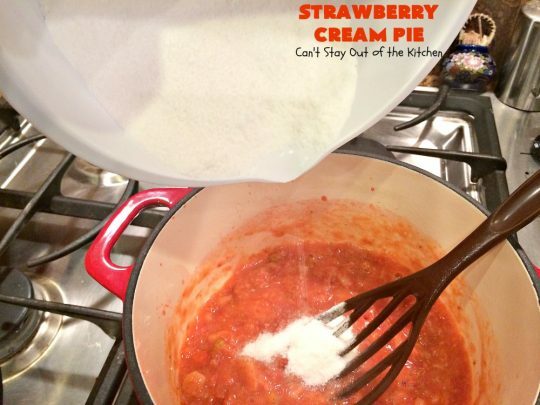 I have never made a strawberry pie before. I used to work at Marie Callendars in my college days, and loved their strawberry pie. I’m really glad to get this recipe. You’re right, it would be so perfect for Valentine’s Day! It’s a fabulous recipe, Shari. It’s really hard to improve on your Mom’s faves! If you have a really deep dish pie plate you may want to make 1 1/2 batches. This amount is really only enough for a small 9″ pie plate. Please let me know what you think of it when you make it. I hope you enjoy it, K.J. It’s one of our family’s favorites. It’s not all that difficult either for a pie. Thanks for stopping by. It is so delicious, Amanda. I hope you make it sometime. It’s pretty easy for a pie. I will be making this. But as I am not a fan of Cool Whip I will be using stabilized whipped cream. MMMmmm… Thanks for a yummy recipe! I’m sure that will work as well, Lin. Hope you enjoy it.